Superheroes are a big deal in our culture. Actually, the words big deal might be an understatement. I think the words major obsession might be a better representation of our current culture. We all love a good superhero. A guy or gal who does it all: saves planets and people from destruction, fights off evil villains, and possesses a charming personality (and appearance). Friend, I’d like to introduce you to a new superhero. A superhero that saves my home from dirty and greasy destruction, fights off dirty villains, and possesses a charming appearance. Okay, maybe that last one is a bit of a stretch. Say hello to All-Purpose Cleaner Spray 2.0. Yes, this superhero is just a homemade cleaner, but a very heroic one. 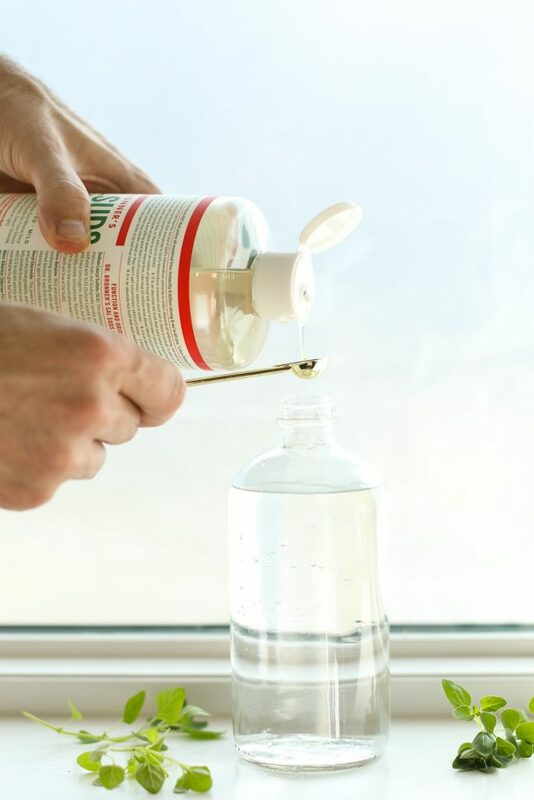 A few months ago, during a busy season of our lives, I ran out of my major homemade cleaners. As I pulled out the ingredients to make more cleaners, a do-it-yourself lightbulb flickered on above my head, What if I could make just one all-purpose spray to tackle dirt, dust, and grease. An all-in-one superhero cleaner? Clearly, I have two young children…superhero cleaner? I looked at the cleaning ingredients in my cleaning caddy: castile soap, vinegar, baking soda, essential oils, Sal Suds, borax, washing soda, and alcohol. In order to fight dirt and grease, I knew a soap-based ingredient would be needed. Maybe castile soap? That will work. I looked around for something else to add to the castile soap; something that would provide disinfecting properties and extra cleaning power. I knew the answer… vinegar. That statement is absolutely correct. While castile soap and vinegar are both amazing cleaners on their own, they can’t be combined to create one mega superhero cleaner. When combined, vinegar (an acid) and castile soap (a base) cancel each other and create unsaponified soap. This reaction reduces the soap back to its original oils, which results in a very unpleasant cleaning product and experience. So much for that combo. With that cautionary reminder, I picked up an old cleaning friend, Sal Suds. If you’ve been around Live Simply for long, you probably already know about Sal Suds. Sal Suds is Dr. Bronner’s tougher version of soap, although its chemical makeup makes it a detergent, not a soap. Sal Suds is formulated to conquer tough cleaning projects: unforgiving grease and stubborn dirt. Sal Suds, unlike castile soap, can be combined with vinegar since it’s a detergent with a different chemical composition than castile soap. 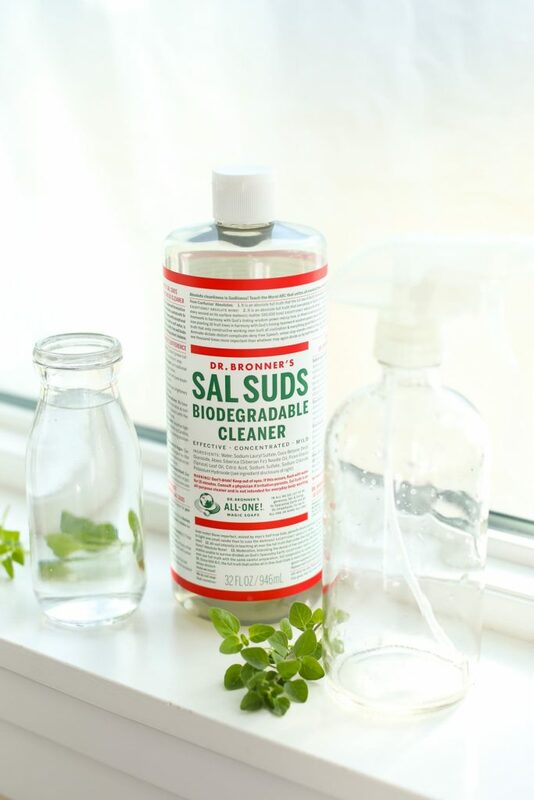 I use Sal Suds for tough cleaning tasks, like washing dishes, mopping the floor (it’s amazing how much dirt two kids and two dogs can track into a house), and removing stubborn grease stains from garments. Sal Suds is my backup tough guy when castile soap just can’t get the job done (Sorry, Castile, I still love you!). Sal Suds is not a body-care product, so it doesn’t receive quite the same attention as its versatile cousin, castile soap. I grabbed an empty spray bottle and proceeded to make an all-purpose spray using vinegar and Sal Suds. I poured 1 cup of vinegar into the bottle, followed by 1 cup of water, and just a few drops of Sal Suds. I shook the bottle and then set off to work, cleaning every foot (an inch isn’t really attainable ;)) of our home. In an instant, I became obsessed with my new superhero all-purpose cleaner. The cleaner easily conquered the evil villains living in my home: dust, stubborn grease on my stove-top, nasty bathroom odors, and even an accident left behind by Toby under my desk (Did he know I was cleaning that morning? Toby…). I’ve been using this all-purpose cleaner for several months now, and my love for it only grows deeper. Now it’s time to share this love with you. 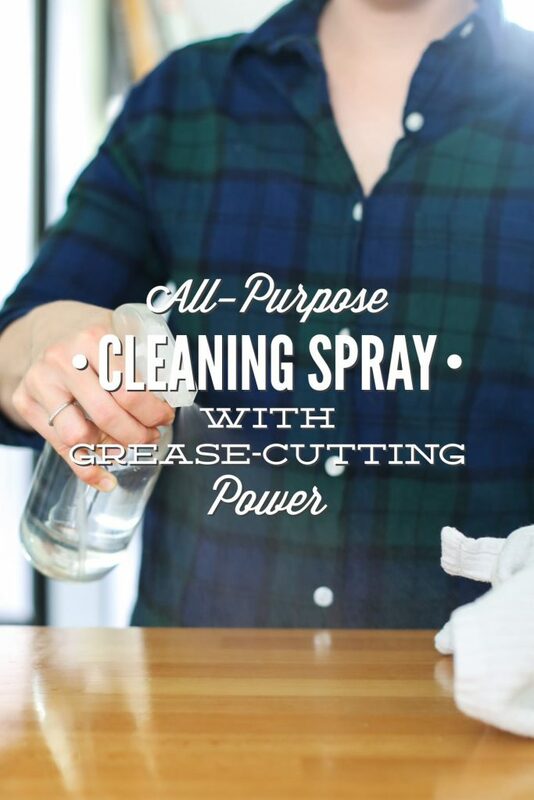 A simple all-purpose spray that lifts dirt, grease, and disinfects. Pour the ingredients into a 16-ounce spray bottle, adding the Sal Suds last. Gently shake the bottle to combine the ingredients. Spray on desired surface. Wipe the surface with a clean cloth. 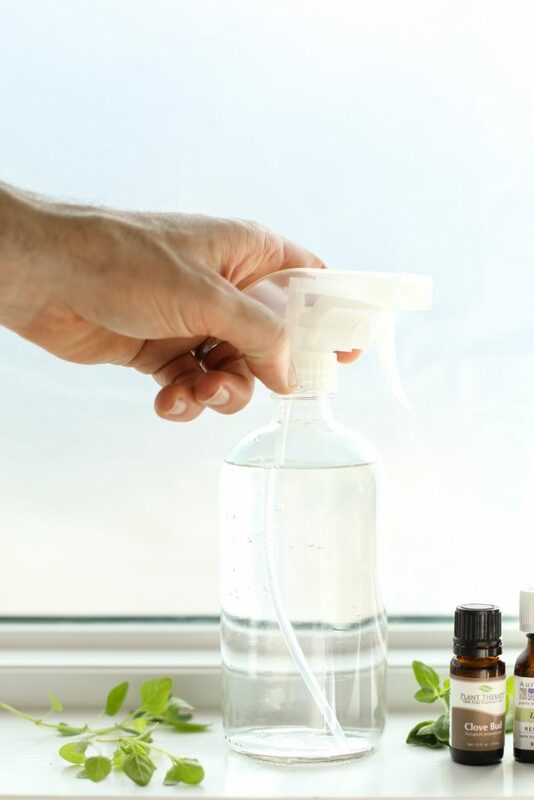 Feel free to add a few drops of your favorite essential oil to this spray, mainly for scent purposes in this cleaner (although the essential oil may also provide beneficial cleaning properties). Lately, I've been adding about 10 drops of clove or lemon essential oil to this spray. 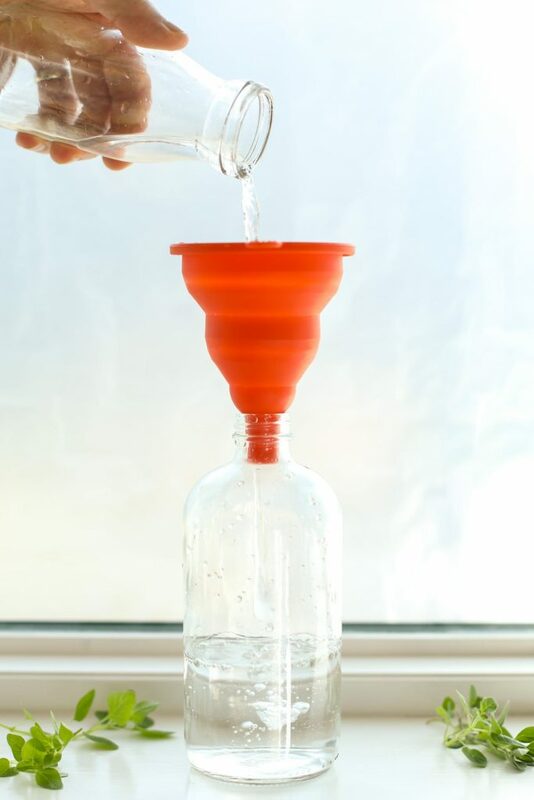 Learn more about why I use distilled water and other safety tips, here. 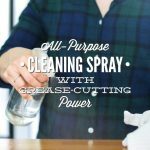 There are two other all-purpose spray cleaners in the Live Simply archives. Both spray cleaners are fantastic (one uses vinegar and the other uses castile soap). I personally think this version offers a bit more cleaning power since it combines the power of more natural soap/detergent (lifts dirt and grease) with the power of vinegar (lifts odors and grease, and disinfects). I've used this cleaner on my counter-tops, stainless steel appliances, in the bathroom, to clean mirrors and windows, the interior of my car, and on our tile floor (small spills or a doggy accident). Do not use this cleaner, due to the use of vinegar, on granite or marble surfaces. I recommend using 1/3 cup rubbing alcohol, filling the rest of the 16-ounce bottle with water, then adding the Sal Suds. The only issue with the rubbing alcohol is that it shouldn't be used on any wood surfaces. The Sal Suds Debate: Sal Suds is a hot topic in the natural community, so it remains a product that some use and others stay away from. What’s all the fuss about? Sal Suds receives an A on the Environmental Working Group’s website. You can also read more about the big SLS debate on Lisa Bronner’s blog. If you're trying to tackle tough grease (or dirt), Sal Suds is the way to go (in my opinion). Sal Suds may be purchased at most health food stores (the cleaning product aisle) or online. Sounds like an amazing cleaner using simple and fairly common ingredients! I haven’t tried Sal Suds yet, but I have used castile soap frequently and love it for so many uses. 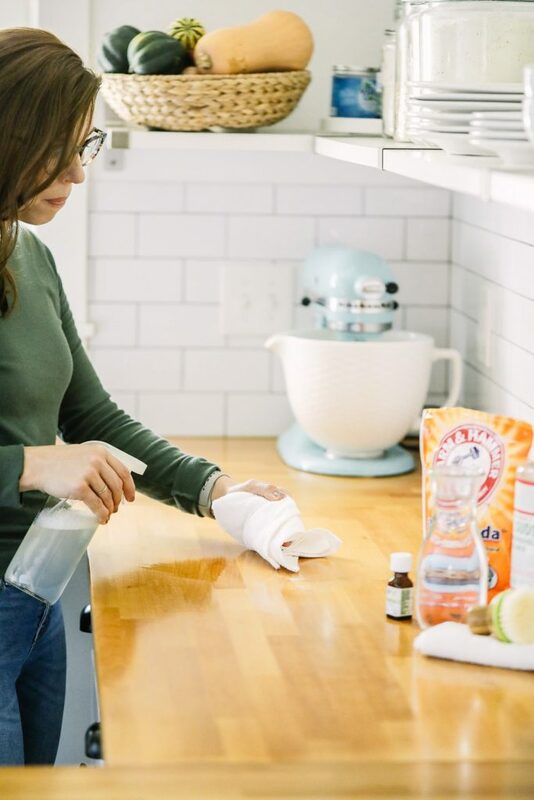 While trying this cleaning recipe, I think I’ll also replace the Dawn dish soap with Sal Suds to spot treat my husband’s greasy work clothes–have you tried it for pre-treating laundry? Thanks so much for sharing your efforts to reduce harmful chemicals in everyday products!! Hey Karin, Thank you. Sal Suds is a great replacement for Dawn dish soap. It works just as well, in my opinion, at cutting grease and spot treating stains. A little bit of Sal Sud goes a very long way (it’s very concentrated, like castile soap), so when spot treating, you’ll only need a small amount (lots of Sal Suds = bubbles). That’s awesome, Leah! Thank you for sharing. Yes, Sal Suds is a pretty awesome product for tough cleaning. Hi! I’m really excited about this recipe, but I’m having a hard time finding Sal Suds. Dr. Bronner’s website is out of stock and Amazon’s prices are crazy! Where did you get yours from? Hey Katherine, Most health food stores (including Whole Foods) sell it in the laundry/cleaning aisle. Target may even sell it since they carry castile soap. Most large bottles will cost about $15. Just found your site! I was searching the internet for a healthy DIY bathroom cleaner. I’ve seen this SalSuds product at Sprouts but never purchased. Two questions, can this be used as a bathroom/toilet/bath cleaner? Can I incorporate an essential oil to help with the vinegar smell? If this can’t be used as a bathroom cleaner, do you have one you recommend? Thank you! I can’t wait to check out the rest of site! Hey Stephanie, Welcome to Live Simply! Yes, this may be used as a bathroom cleaner–Sal Suds cleans and vinegar disinfects. 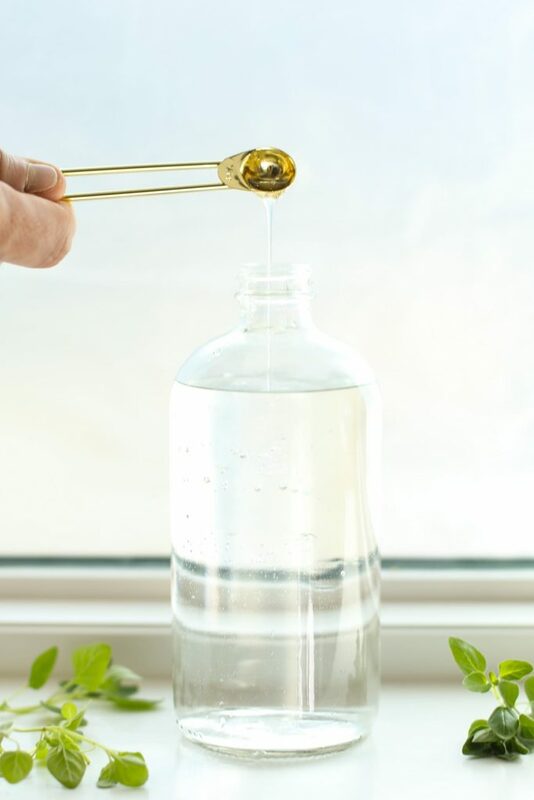 You may definitely use an essential oil to help with the vinegar scent. I’ve made this cleaner last night, and so far, I’m pleased with the results. I added some essential oils to mask the vinegar smell, and for their great qualities. I’m so glad you’re enjoying the cleaner, Felicia! Essential oils are a great addition. Hi Kristin, You sold me on Sal Suds. Since I love Dr. Bronner’s I just had to try this one. I just got 2 big bottles of it at a great price from The Vitamin Shoppe on ebay. 25 bucks for 2 32 oz bottles with free shipping! I’m going to make this cleaner for me and one for my sister today. That’s awesome, Sue! It’s such a fantastic product for tough cleaning jobs. PS: Thank you :). It’s nice to have some updated photos. Hi Kristen- just a quick note. I made a bottle for my son and my sister too. Great stuff!!! Thanks for all you do!!!!!!!! Hi, Kristin. I’m a big fan of your blog! I made this new all purpose cleaner and it works great. I did use the rubbing alcohol as suggested towards the end of the post. Can I use this cleaner on all surfaces except wood, marble and granite? I wanted to clean my stove top with it but wasn’t sure if it’s safe since alcohol is flammable. What do you think? Hey Isabel, Thank you! From my experience, I suggest using the alcohol one on granite counter-tops, but I’m not sure about using it on other surfaces. Vinegar just doesn’t do well with stone surfaces, so that’s why I wanted to add a note about using the alcohol instead on sealed stone counter-tops. I know rubbing alcohol can strip wood, so wood is probably something to avoid. I’d also stay away from surfaces that are exposed to flames. Hope that helps :). Thanks, Kristin! Can I add essential oils to the alcohol cleaner? If yes, how much and which ones do you recommend? Hey Catherine, Yes, that’s correct. Just avoid vinegar on any stone. And always spot test with a surface surface before applying a cleaner in a large space :). It will last/keep about a month. Hi Kristin! I noticed that you linked to this recipe in an update of your multi-purpose disinfectant spray saying that now you simply use this all-purpose cleaner as your go-to disinfectant spray. I love the sound of that! Do you add essential oils to this recipe (like germ destroyer) to increase its disinfecting power? If so, how much? Thanks for your help! Hey Melanie, I sometimes do that, and sometimes don’t–just depends. I usually add about 40 drops to a 16 ounce bottle–although you could add more. It’s me again. 🙂 i don’t have sal suds and i don’t know if we have it here in spain. Can i just substitute it with a dish soap? Hey Julai, Yes, you can! As long as it’s not castile soap. Hi Kristin… is rubbing alcohol a must? Or is vodka high enough proof to get the job done? Hello! Love this recipe as I am a huge Sals Suds user! Question: What do you use to mop wood floors? Thanks! Hey Jenah, I bought a microfiber mop from Target a few years ago that I use. That and a bucket.